Always define success before you start an endeavor. 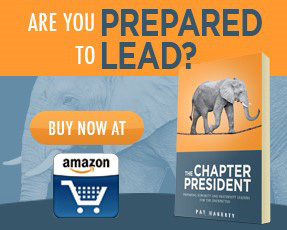 How will you determine if your term as president was successful? Your goals for the upcoming year should be measurable, and you should be able to fit them on a single sheet of paper. Keep these goals visible during the year so you don’t lose sight of your objective. You will have a lot of people counting on you during the semester. The summer is the time to become as smart as you can, to assure you are as prepared as you can be. Spend this time tapping into all your resources for great fraternity advice such as The Fraternity Leader, the fraternity president who preceded you, older brothers, your chapter advisor, the Greek life staff and any other knowledgeable resource out there. A fraternity house takes a beating during a school year. Take advantage of the time during the summer to spruce the place up a bit. You don’t have to invest a lot of money or time to make a difference. A coat of paint on a room or two and planting a few bushes in front could make a huge difference. The value in this improvement will really be apparent when the brotherhood gets back from the summer off. They will notice the improvements, and that will create a positive energy around the house. This is a great way to start the year. Part of being a leader is being the bigger man. You may have had a disagreement with a brother in the past. Take this opportunity to bury the hatchet. The last thing you need at the start of an exciting year is to have someone who isn’t 100% behind you and your vision for success. Don’t go into a new year with old grudges. Convention is a fantastic time, and every brother should attend at least once during their four years. However, be sure to take advantage of everything convention has to offer. Meet other brothers from other chapters and learn from them. Learn from the alumni and fraternity staff. Hopefully you can pick up a thing or two from guys like me, who are guest speakers at conventions. The last thing you need to do is spend the few days in a drunken stupor and miss all these great opportunities. Finances can ruin your fall semester long before it ever starts. I had a semester like that as president of my fraternity. We could not fill the house during the summer, and the treasury was drained by the time everyone came back from summer break. Meet with your treasurer and be sure to have a solid understanding of the chapter’s financial situation. Use this opportunity to plan fundraisers and discuss budgets. This could be the most valuable few hours you spend all summer. When everyone gets back from break, you will dive straight into fall rush. Be sure your rush chair has everything planned and ready to go. In addition, stay in close contact with the fraternity to ensure the brothers are maintaining a list of prospective new members. Don’t wait until the fall to let them know what you are up to! Send out emails, send out a newsletter, do something so that the brotherhood is aware of what has been planned. This will help make sure the fraternity is fired up and anxious to get back to campus. There are going to be brothers who graduate and leave school for whatever reason every summer. Be sure to get with the Greek Life office and your national headquarters to get them taken off your fraternity roll. The last thing you want is to be paying for brothers who are not active in the fraternity. A lot of fraternity presidents don’t meet their school’s director of Greek Life until they are in trouble. Don’t be that guy. Call and schedule a meeting to introduce yourself. Discuss with him/her your plans for the year and let them know how excited you are. Believe it or not, these folks are almost as interested in your success as you are. They will be able to give you valuable insight and advice to make your journey a little easier.